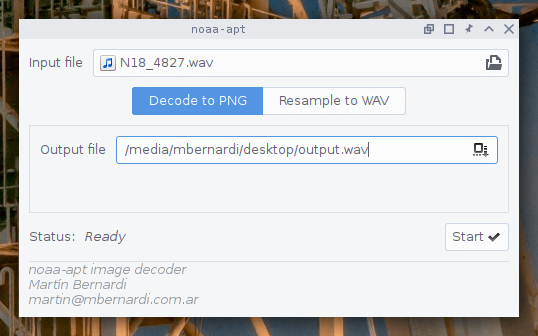 Over on GitHub user martinber has released a new NOAA APT image decoder that can run on both Linux and Windows. The decoder is called noaa-apt and takes a .WAV file of a NOAA satellite pass, and turns it into an image file. The .WAV file can be recorded in any SDR program like SDR#, HDSDR, GQRX etc. The program is programmed in Rust, and has ready to run binaries available for both Linux and Windows available on it's GitHub Releases page. Compared to the features found in WXtoIMG the software is fairly basic, but as WXtoIMG has been abandoned it's good to see new APT decoders still being worked on. The software can also be used to simply resample the .WAV file into a sample rate required by other more featured decoders like aptdec. NOAA weather satellites broadcast an Automatic Picture Transmission (APT) signal, which contains a live weather image of your area. 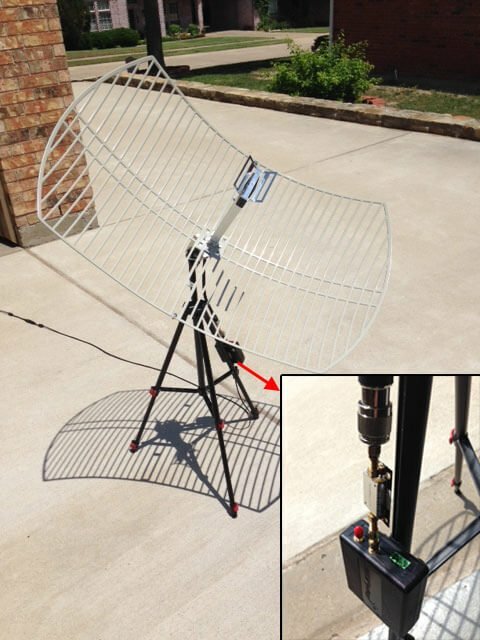 With an RTL-SDR and antenna they can be received and downloaded every time one of the satellite's passes overhead. We have a tutorial on using an RTL-SDR with WXtoIMG available here. Thank you to Reiichiro Nakano for submitting news about his work on converting the Pascal based meteor_decoder software into a C++ GNU Radio block. meteor_decoder is a decoder for the Meteor M2 weather image satellite. Meteor M2 is a Russian weather satellite that transmits images down in the digital LRPT format. 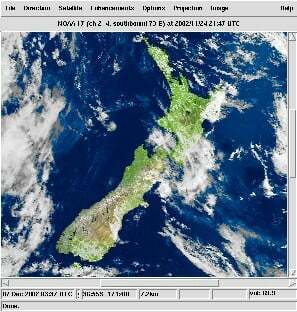 This provides much higher resolution images compared to the NOAA APT signals. With an RTL-SDR, appropriate satellite antenna and decoding software it is possible to receive these images. Just wanted to share a simple project I built for my company Infostellar, in the past week. I converted https://github.com/artlav/meteor_decoder to C++ and placed it within a GNURadio block for direct decoding of Meteor M2 images. It's a sink that expects soft QPSK demodulated signed bytes. Once the flowgraph stops running, it parses out received packets and dumps the received Meteor images in a specified location. The block is part of our Starcoder repository and can be installed from here (https://github.com/infostellarinc/starcoder/blob/master/gr-starcoder/lib/meteor_decoder_sink_impl.cc ). Just a note that the website for the popular NOAA APT weather satellite decoding software WxtoImg is currently down, and may possibly never be revived. This software is commonly used with RTL-SDR dongles to download weather satellite images from the NOAA 15, 18 and 19 polar orbiting satellites. It seems that the author of the software has not been maintaining the site and software for a while, although there was a brief update on the site back in 2017 when the professional version keys were released for free. But the keys reportedly no longer work. WXtoImg is closed source, so the code is not available either. Some of the downloads are still available via archive.org, however it only seems to be the Windows and some of the Linux versions that were archived. Over on two Reddit threads  , some users are also collecting the last free versions and making them available for download again. If anyone has access to the last beta versions for ARM devices please upload them somewhere too. Also if anyone happens to have the contact details of the author, or someone who knows the author please let us know as we'd like to ask for permission to mirror the files. 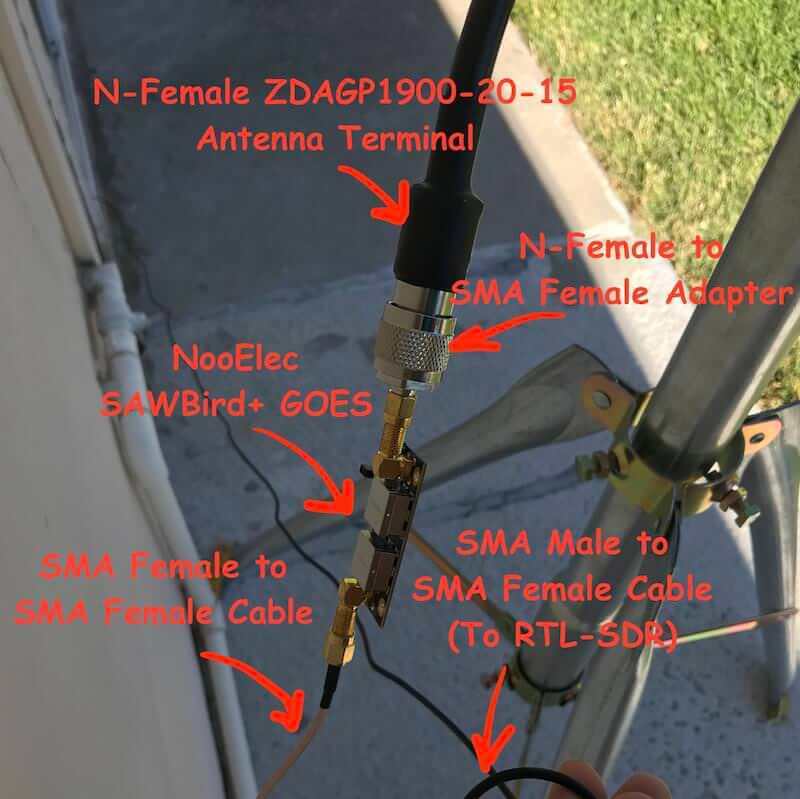 Over on Twitter and his github.io page, Pieter Noordhuis (@pnoordhuis) has shared details about his low cost RTL-SDR based GOES satellite receiving setup. GOES 15/16/17 are geosynchronous weather satellites that beam back high resolution weather images and data. 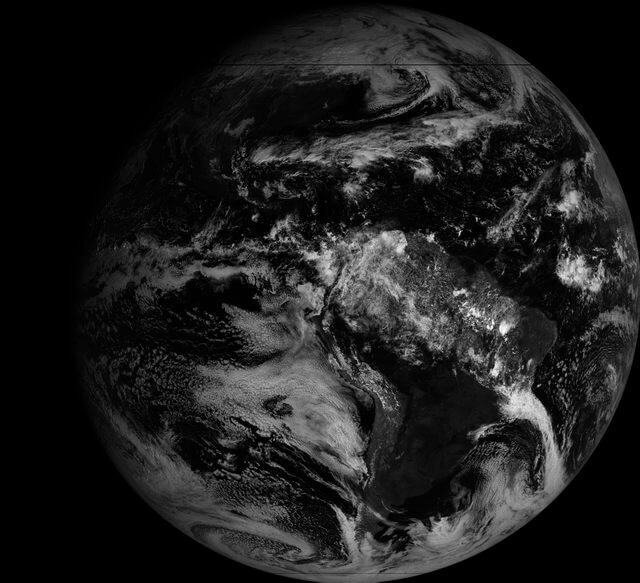 In particular they send beautiful high resolution 'full disk' images which show one side of the entire earth. As the satellites are in geosynchronous orbit, they are quite a bit further away from the earth. So compared to the more easily receivable low earth orbit satellites such as the NOAA APT and Meteor M2 LRPT satellites, a dish antenna, good LNA and possibly a filter is required to receive them. However fortunately, as they are in a geosynchronous orbit, the satellite is in the same position in the sky all the time, so no tracking hardware is required. In the past we've seen people receive these images with higher end SDRs like the Airspy and SDRplay. However, Pieter has shown that it is possible to receive these images on a budget. 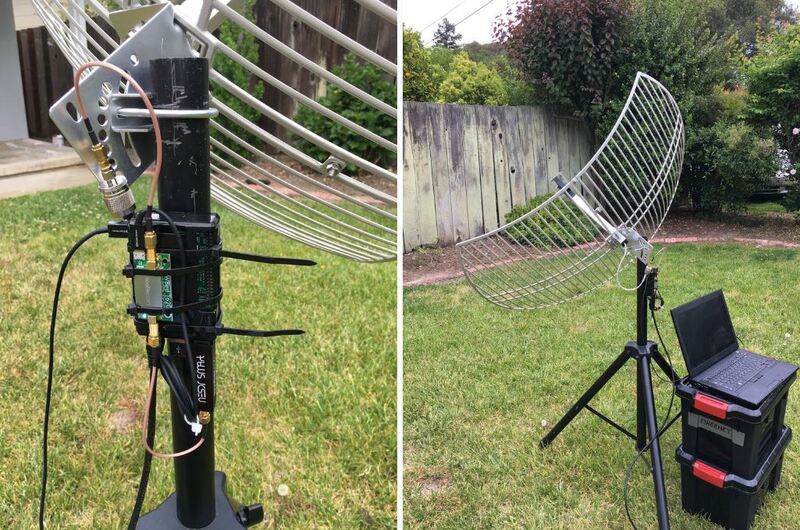 He uses an RTL-SDR, a 1.9 GHz grid dish antenna from L-Com, a Raspberry Pi 2, the NooElec 'SAWBird' LNA, and an additional SPF5189Z based LNA. The SAWBird is a yet to be released product from NooElec. 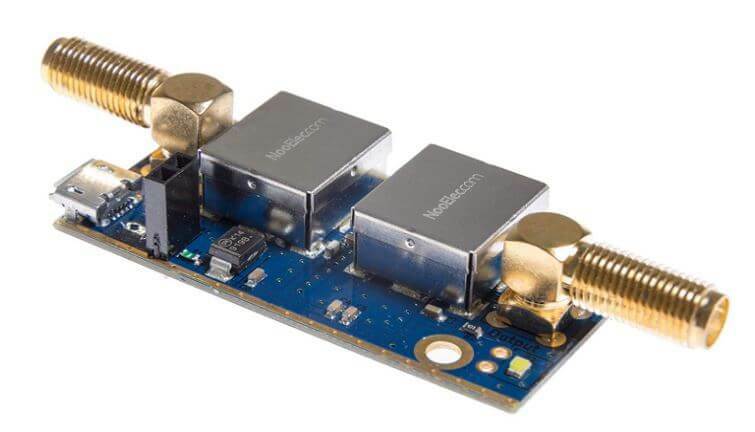 It is similar to their 1.5 GHz Inmarsat LNA, but with a different SAW filter designed for 1.7 GHz GOES satellites. The total cost of all required parts should be less than US $200 (excluding any shipping costs). Pieter also notes that he uses the stock 1.9 GHz feed on the L-com antenna, and that it appears to work fine for the 1.7 GHz GOES satellite frequency. With this dish he is able to receive all three GOES satellites at his location with the lowest being at 25 degrees elevation. If the elevation is lower at your location he mentions that a larger dish may be required. It may be possible to extend the 1.9 GHz L-Band dish for better reception with panels from a second cheaper 2.4 GHz grid dish, and this is what @scott23192 did in his setup. For software Pieter uses the open source goestools software that Pieter himself developed. The software is capable of running on the Raspberry Pi 2 and demodulating and decoding the signal, and then fully assembling the decoded signal into files and images.